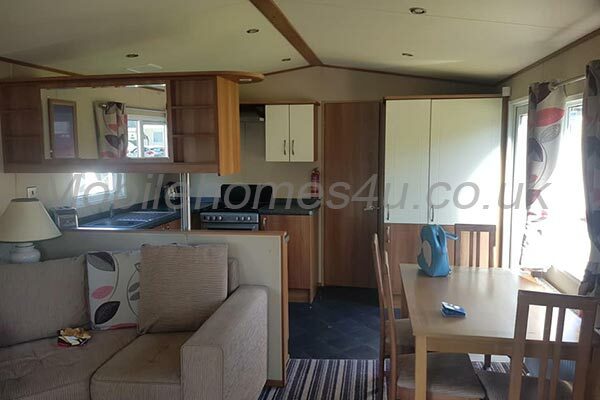 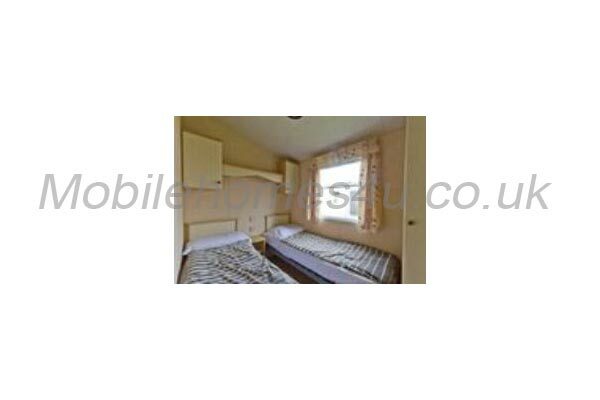 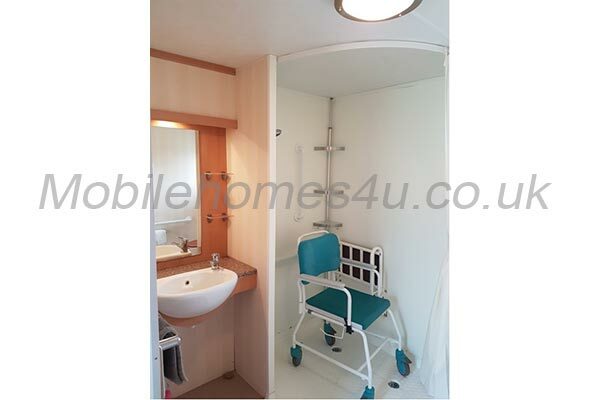 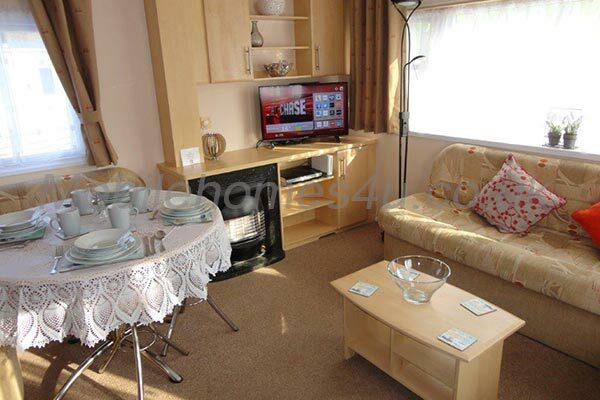 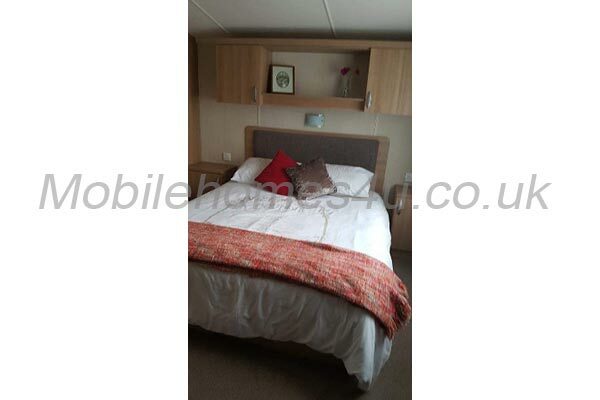 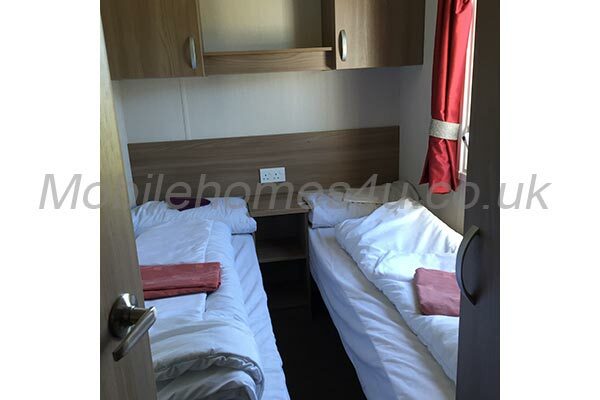 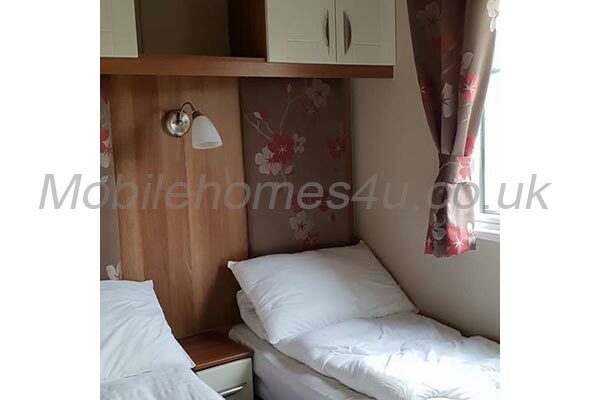 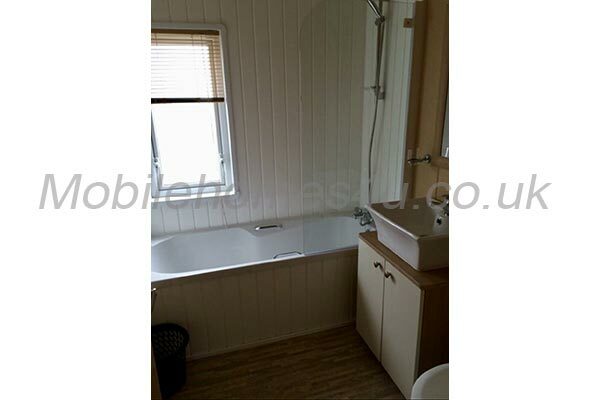 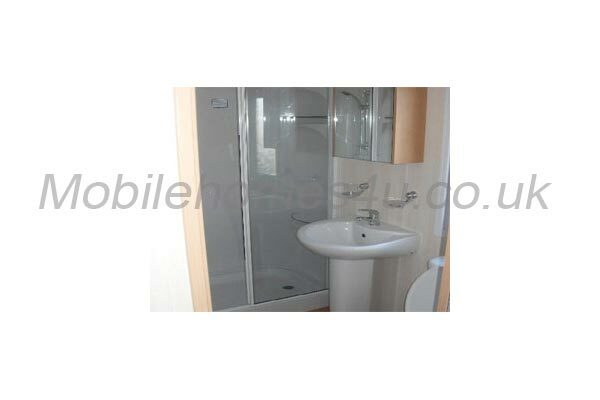 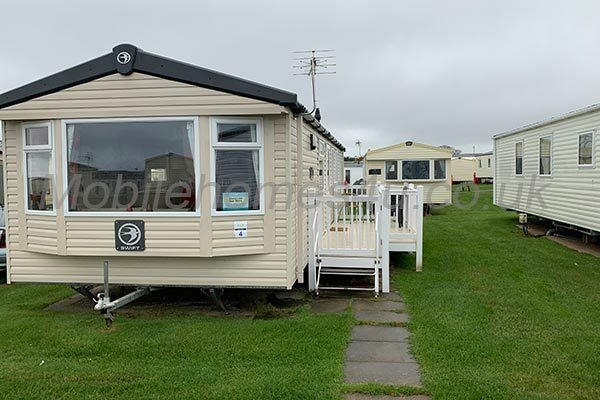 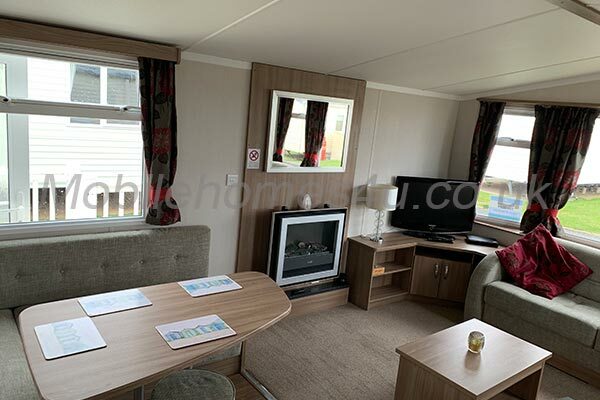 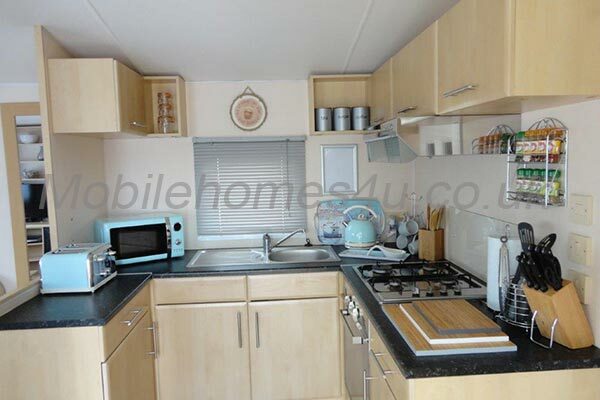 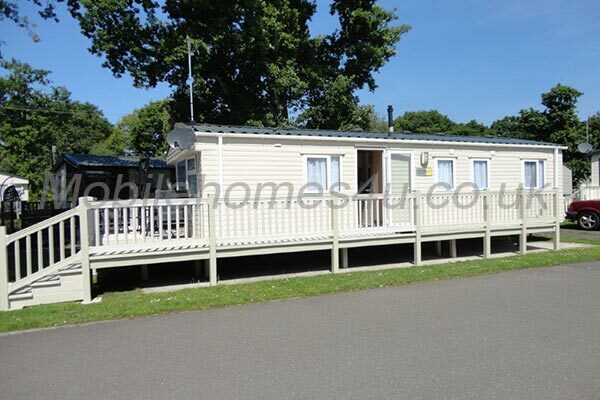 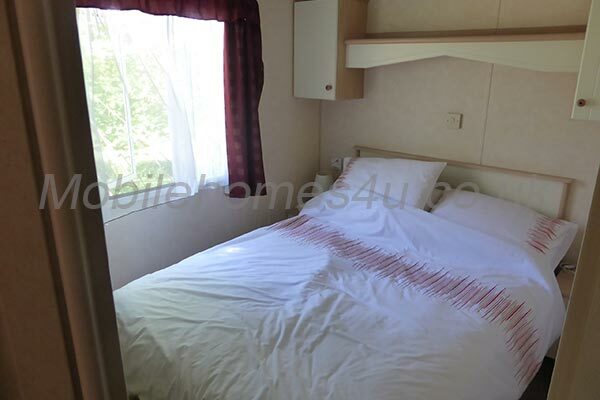 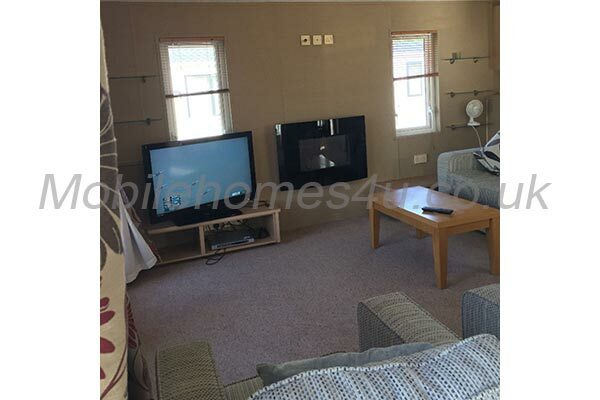 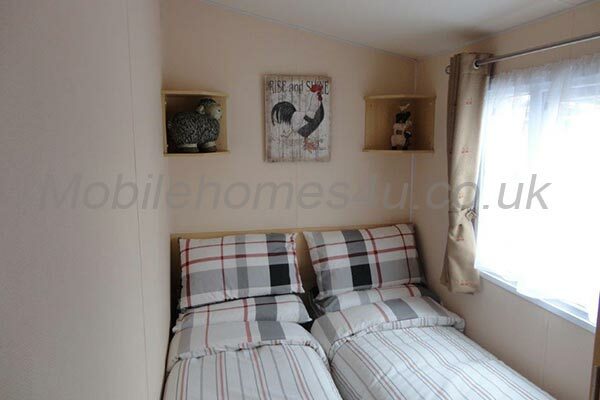 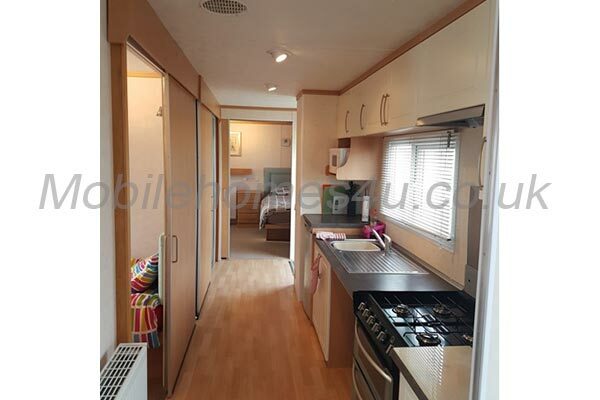 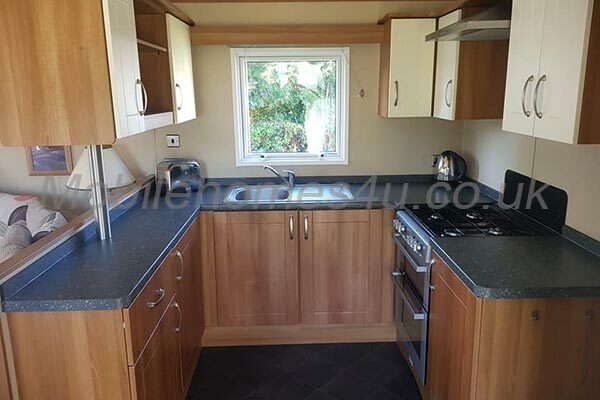 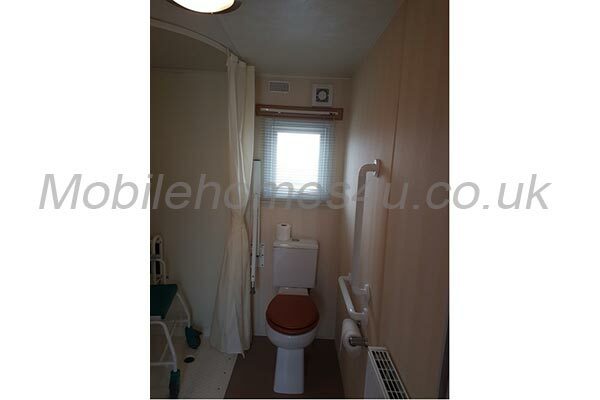 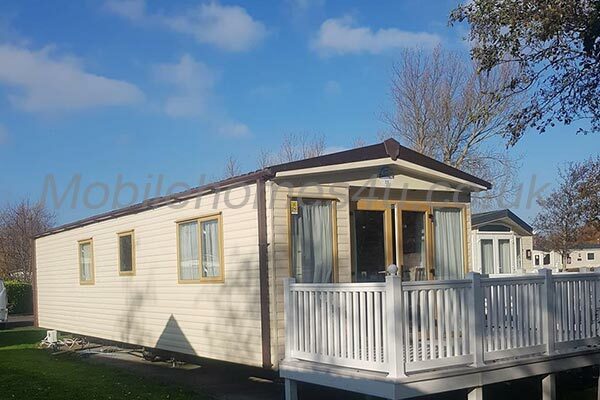 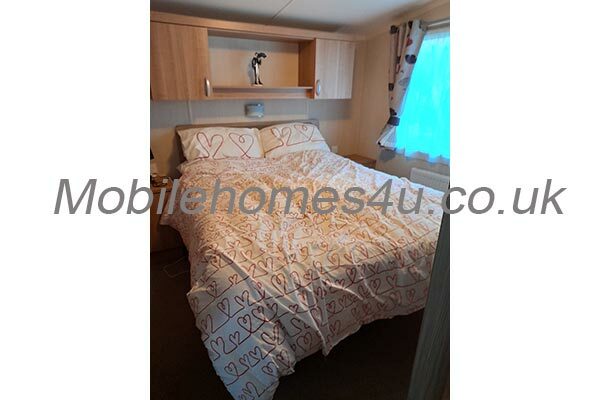 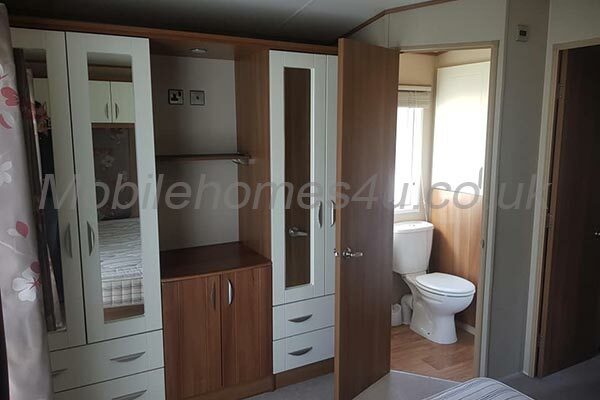 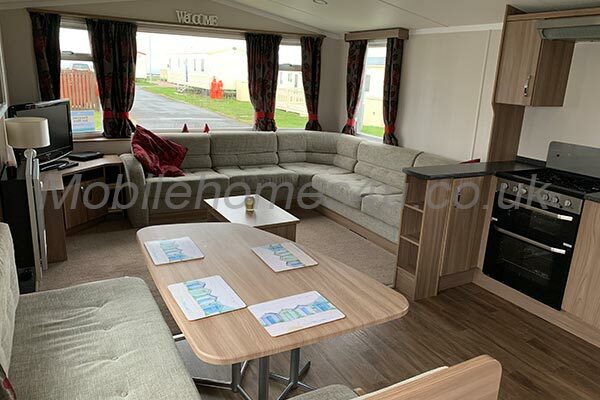 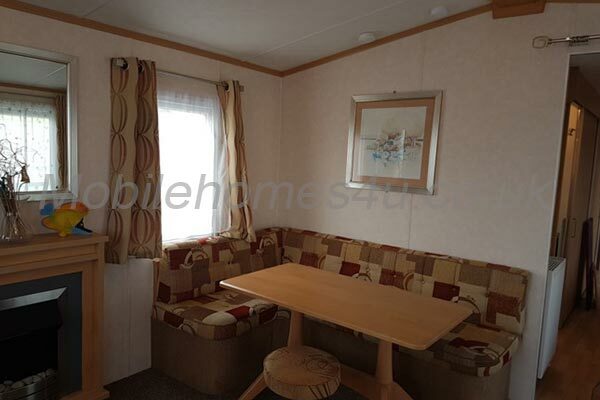 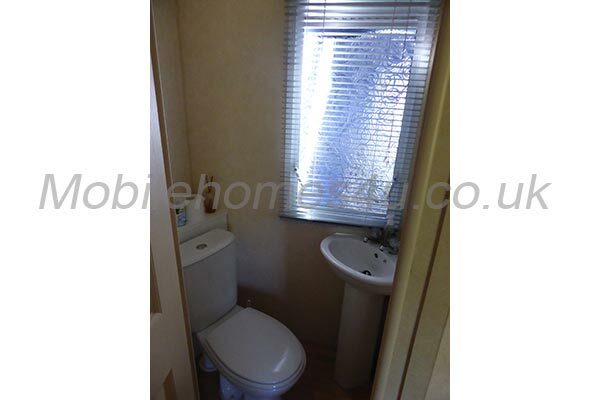 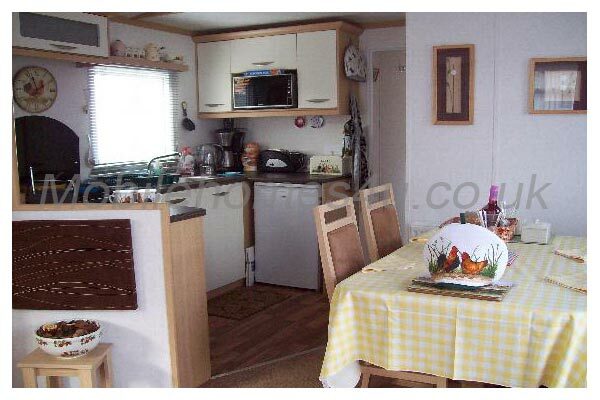 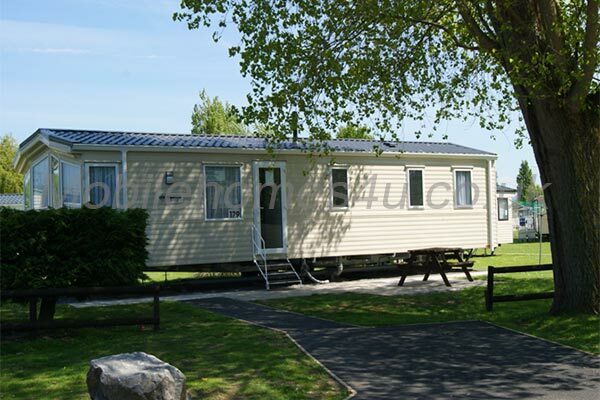 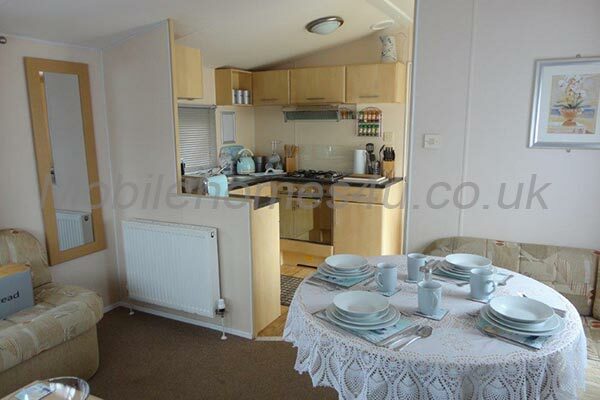 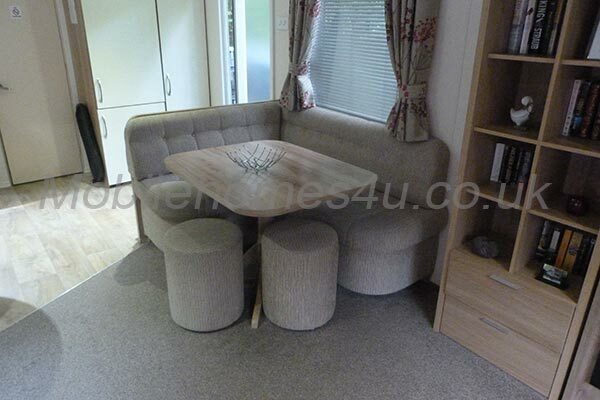 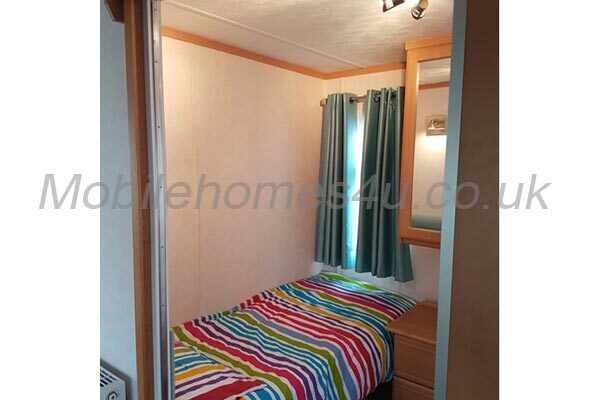 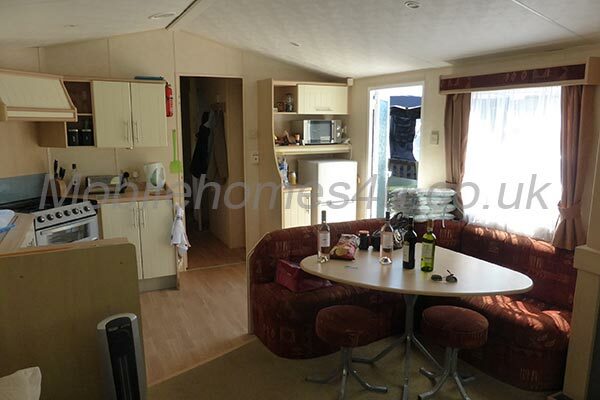 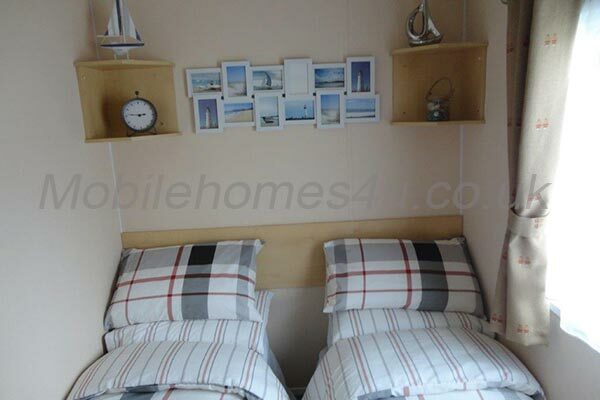 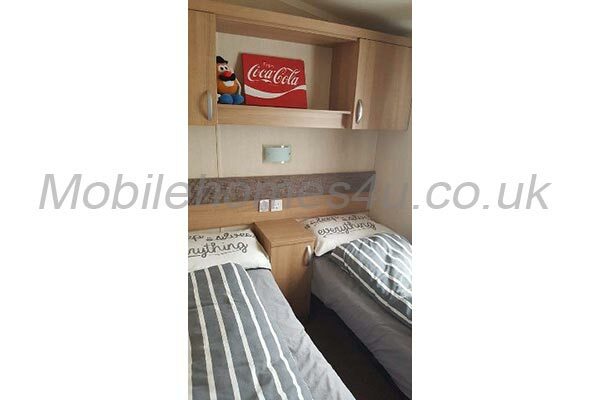 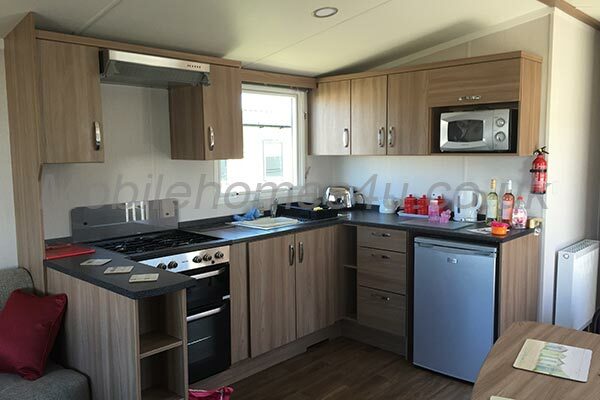 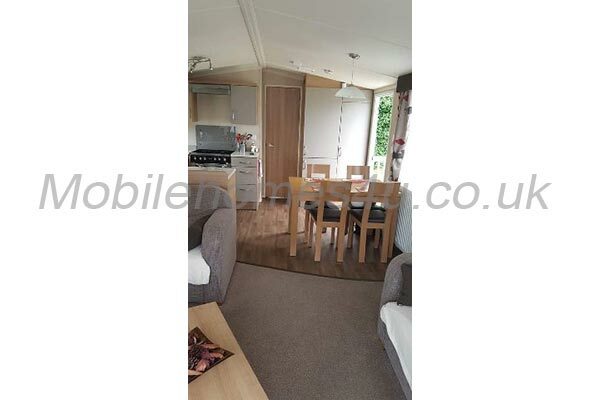 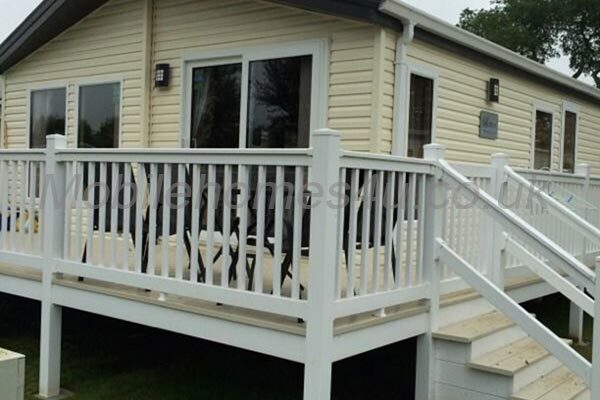 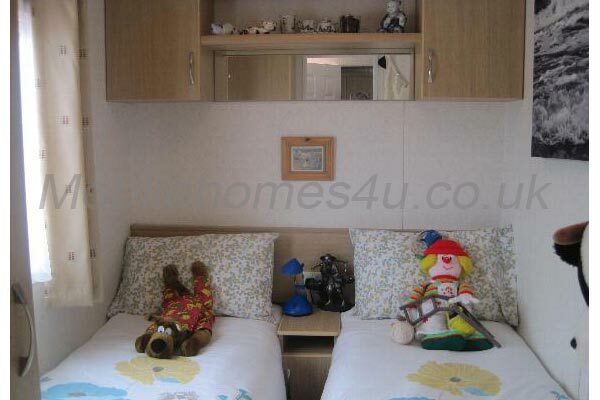 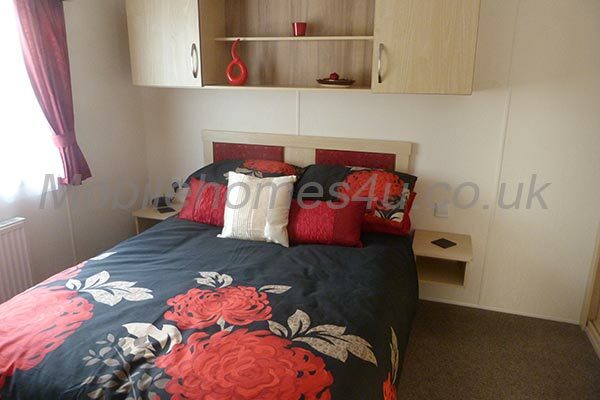 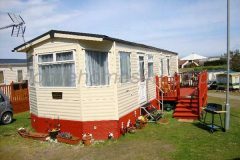 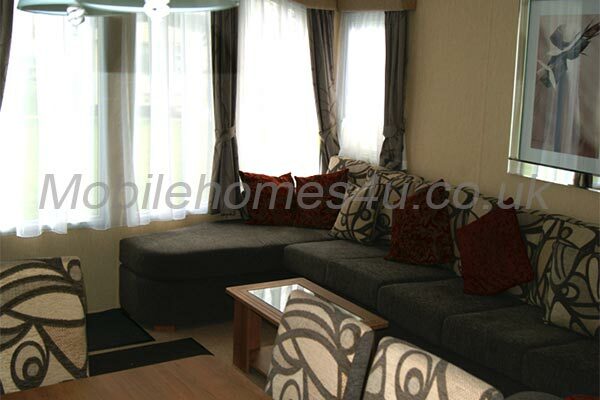 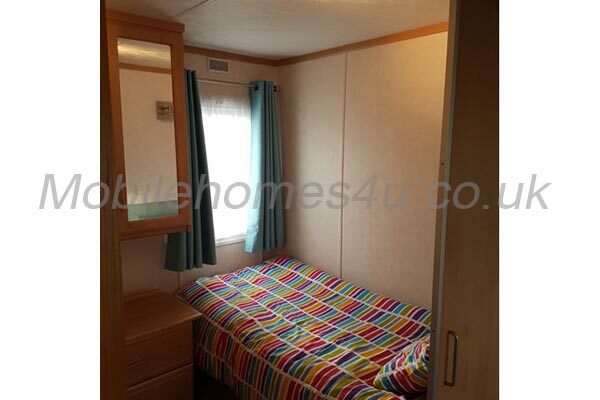 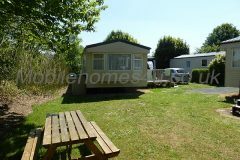 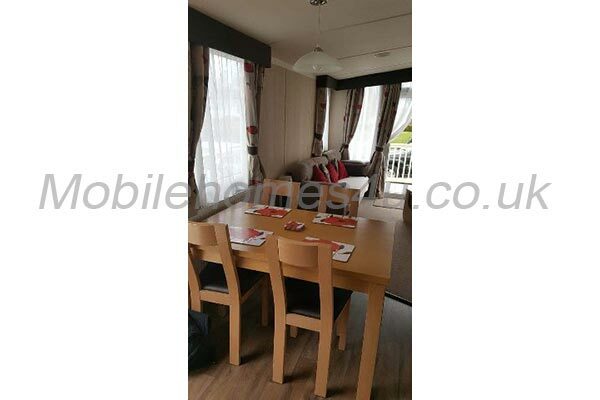 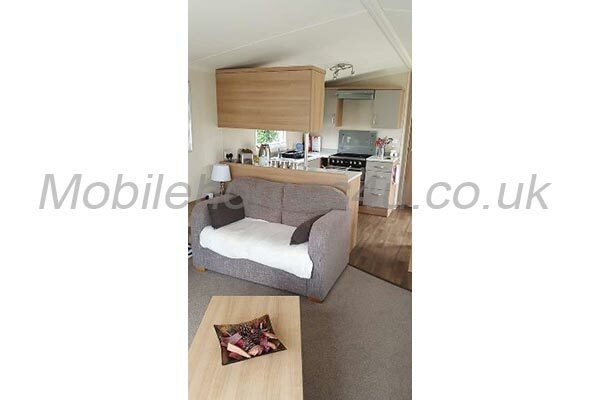 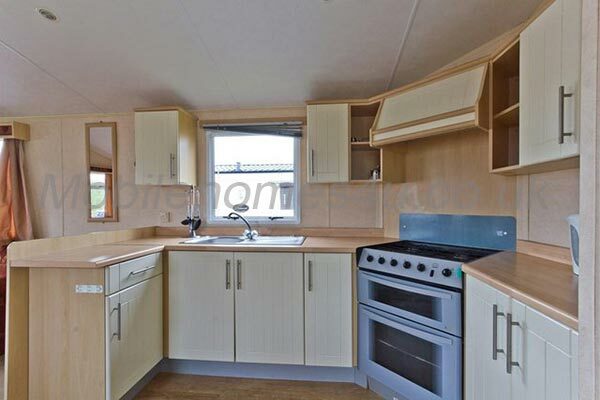 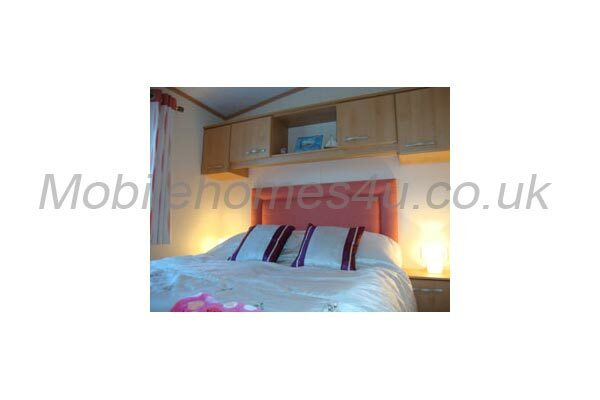 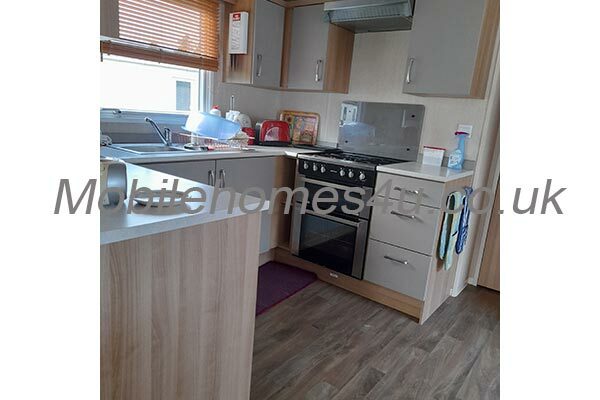 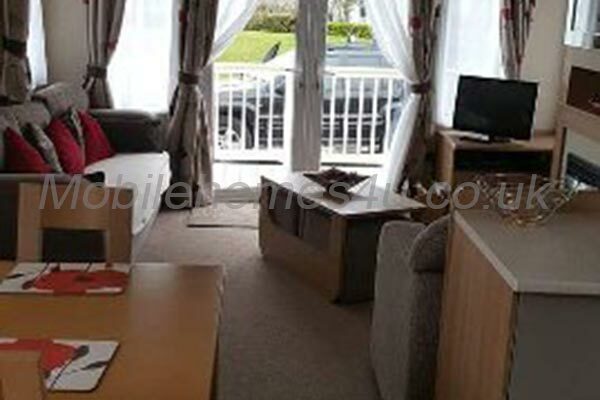 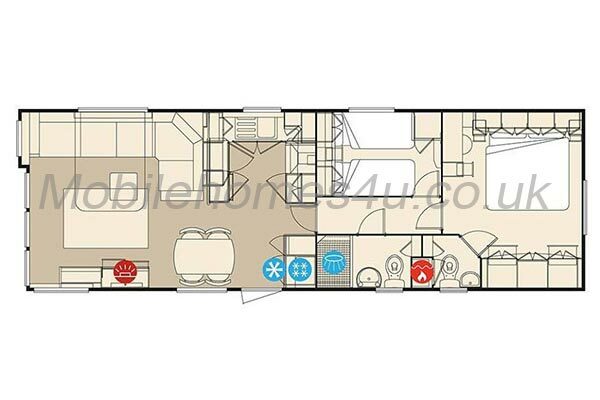 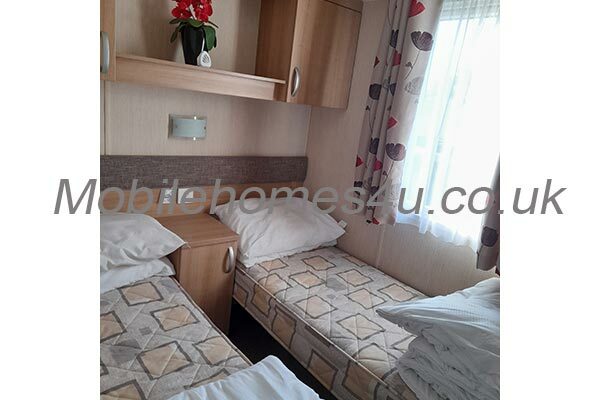 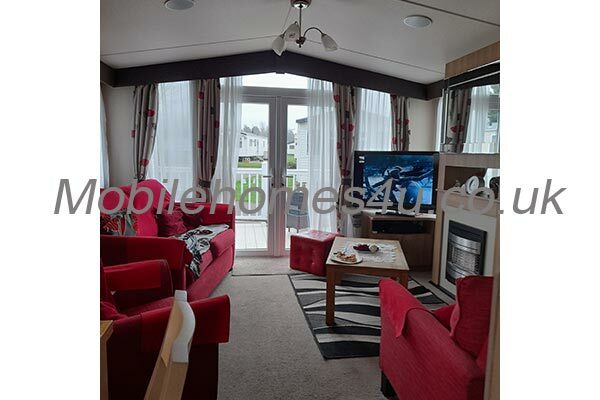 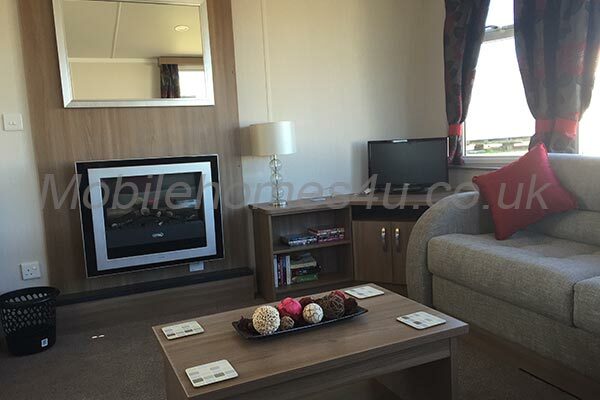 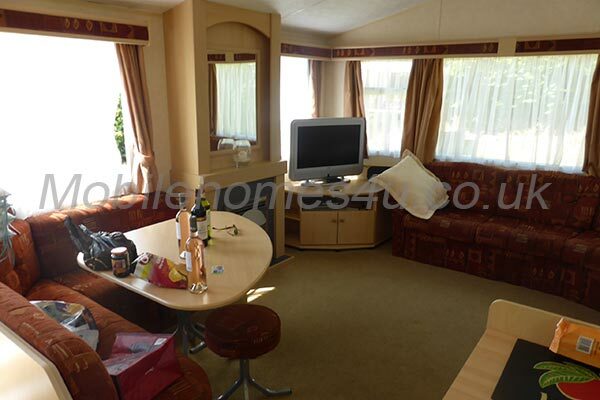 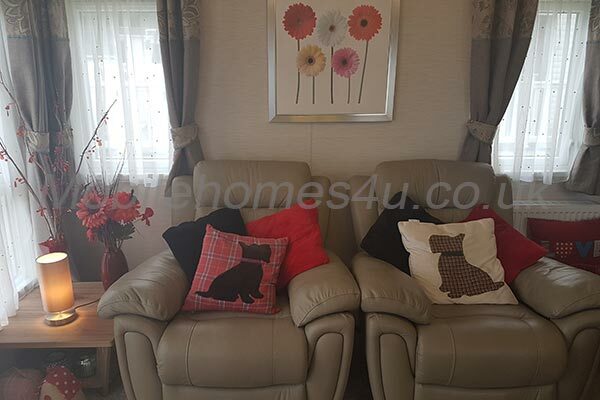 A modern six-birth caravan with all up to date facilities which include double glazing and central heating throughout. 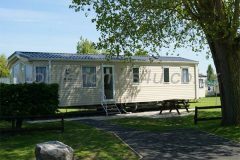 The caravan is on a private stream side plot at Aberdunant Hall Holiday Park which is a beautiful tranquil setting to relax and explore. 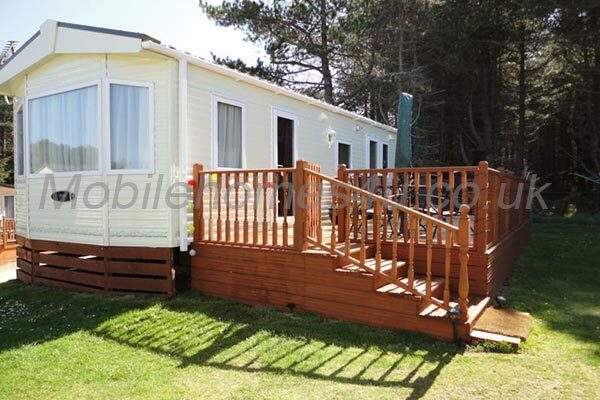 The Park is situated to offer the best of both worlds, nearby glorious beaches and the stunning scenery of Snowdonia. 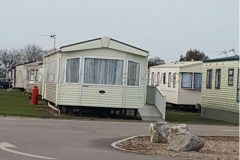 Porthmadog is 3mile away and the starting point for the Ffestiniog and Welsh Hiland Railways, it also has a marina which is useful if you like sea fishing. Portmerion is 3 miles from the site, this is an Italian Village that was famously used in the orginal TV series (The Prisoner). 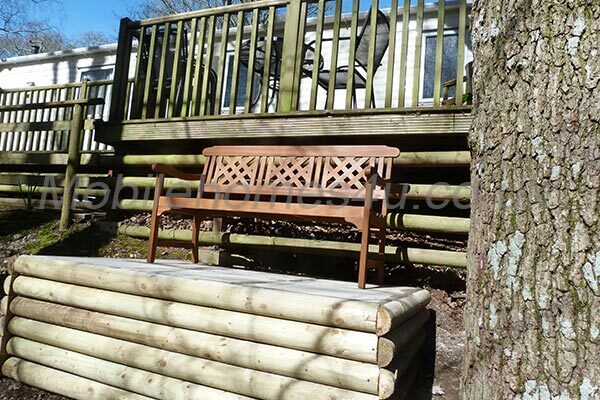 Beddgelert is a famous walking village 3 miles east of Aberdunant. 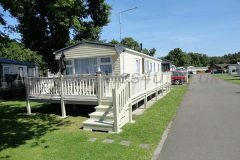 It has a scenic river walks, tea shops, pubs and restaurants. 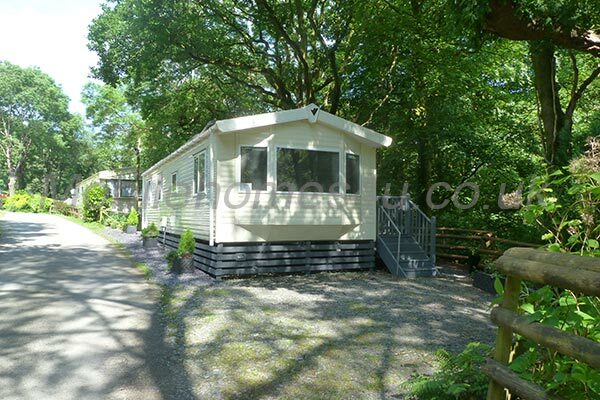 Snowdonia is Wales highest mountain and is only 7 miles north of the park. 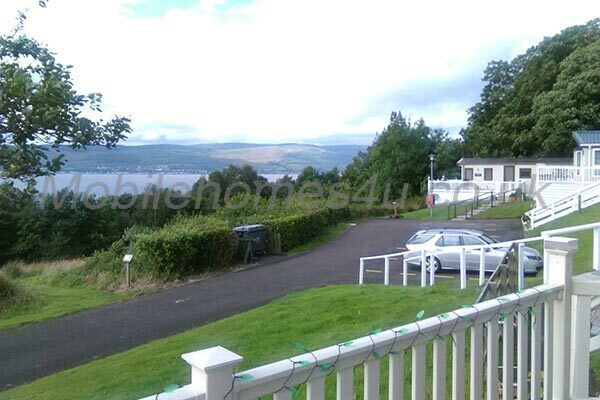 On a clear day from the summit you can see Scotland, England, Wales and Ireland. 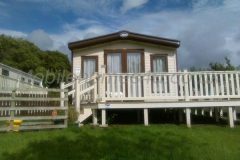 Black Rock Sands is 2 miles west of Porthmadog and is 4 miles of unbroken sand which has a wide variety of water activities to enjoy. Llyn Peninsular has golden beaches at Cricieth, Pwthewlli and Abersoch. 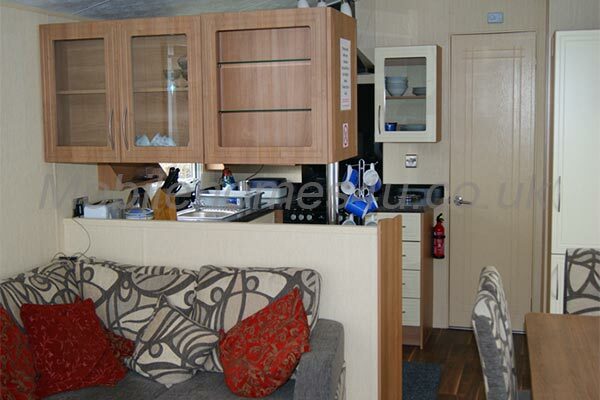 In the caravan you will find information on all surrounding places to see and activities you may wish to partake in. 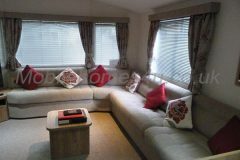 The lounge area has large wrap-around seating and has a gas fire for the colder evenings when the heating is not required. 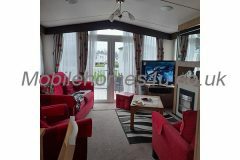 The lounge is also equipped with a 40 inch Freeview television which has an inbuilt DVD player. 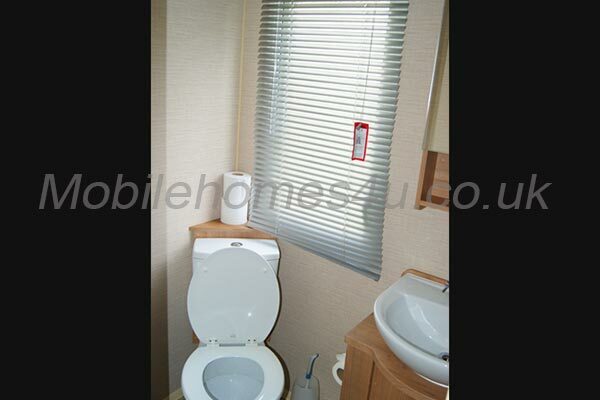 We have provided a lamp with a reading arm if required. 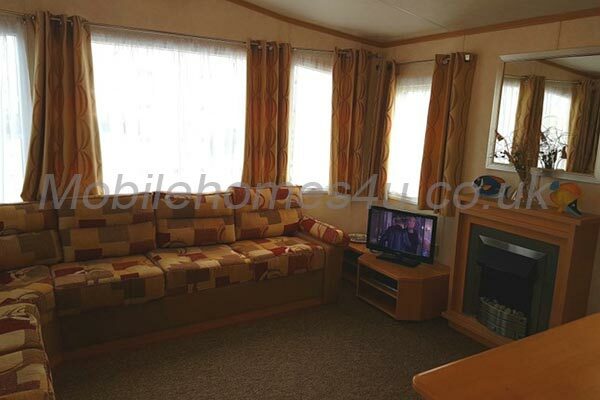 There is a small library of DVDs, books and games but please feel free to bring your own favourites from home. 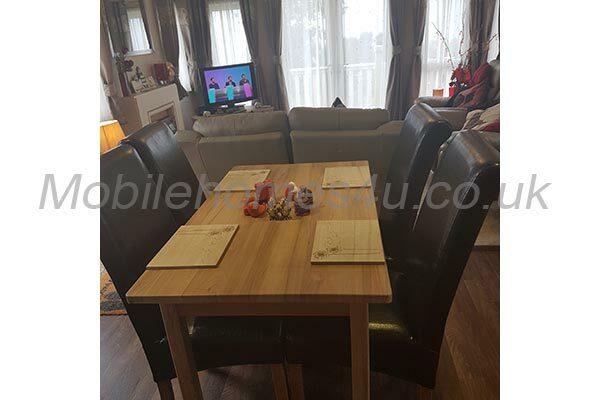 The dining area which is set away from the main sitting area has L-shaped seating and two matching stools which is adequate for six adults. 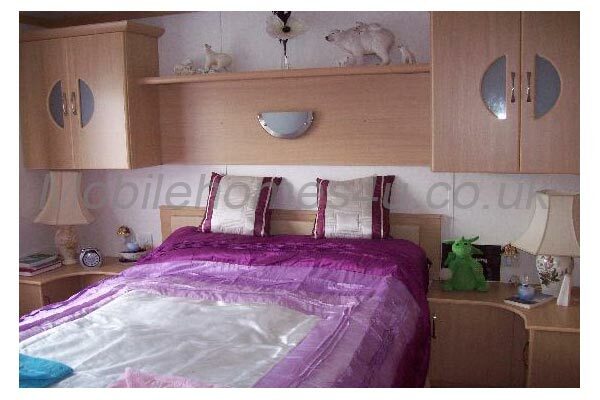 There is an additional stool in the bedroom if required. 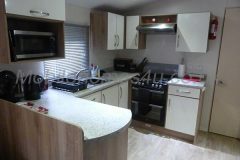 The Kitchen area is well stocked, with all the kitchen utensils you may require and also tableware etc. for outside BBQ's. 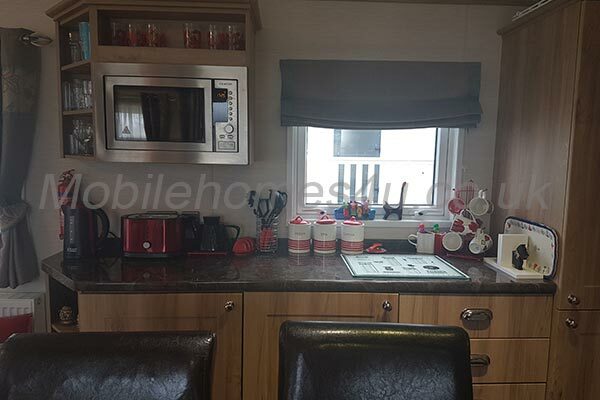 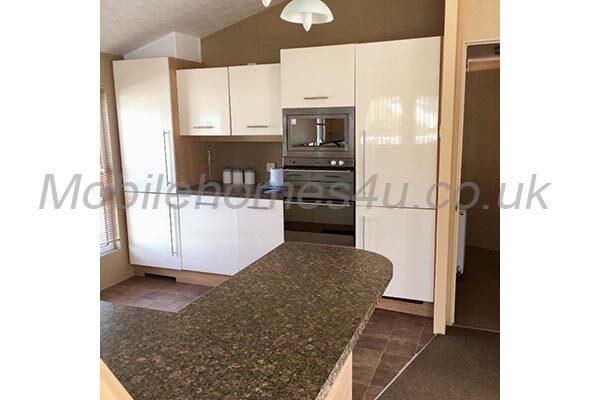 There is a microwave, full-size gas cooker with oven, grill and extractor fan, toaster, coffee maker (Nescafe pods not supplied), slow cooker and a large integrated fridge and freezer. 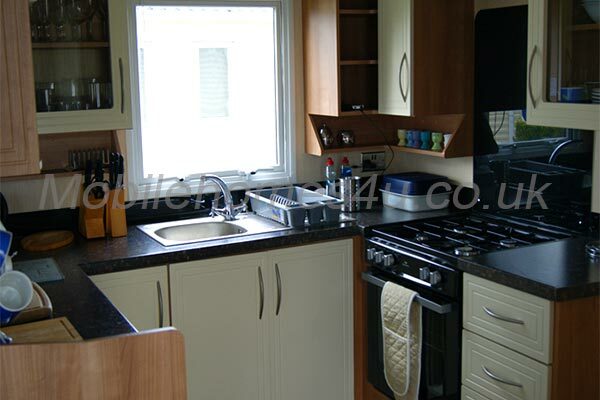 Next to the fridge and freezer is the boiler cupboard which housed the boiler and cleaning equipment to use if needed. 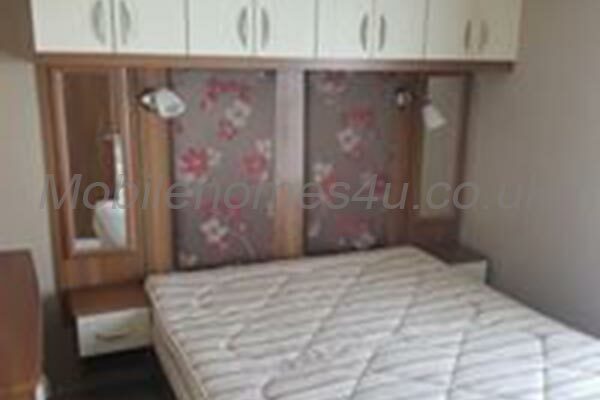 There is also supplied an iron and ironing board, clothes airier and hairdryer for your use. 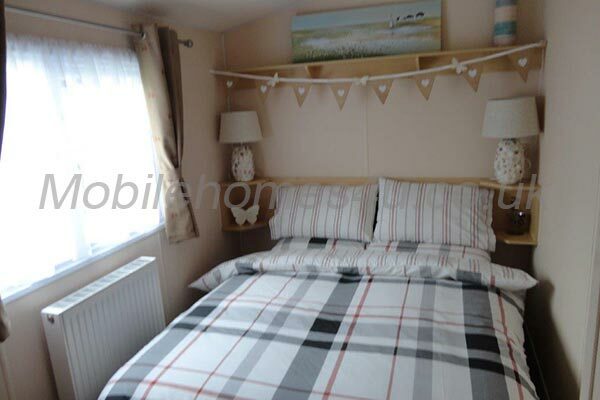 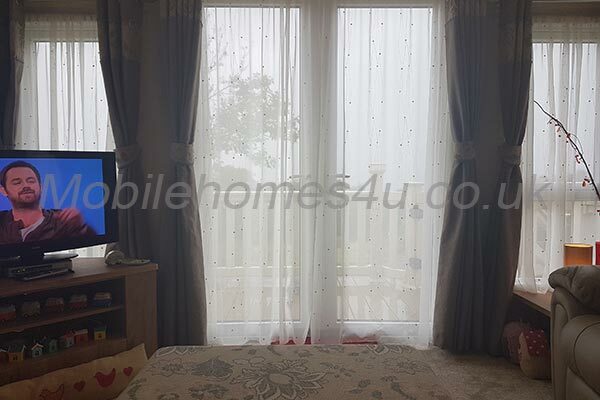 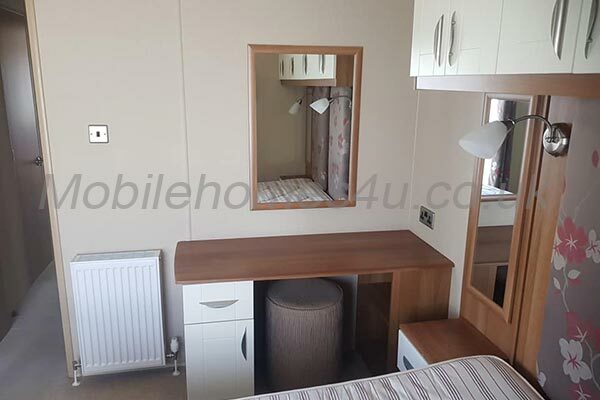 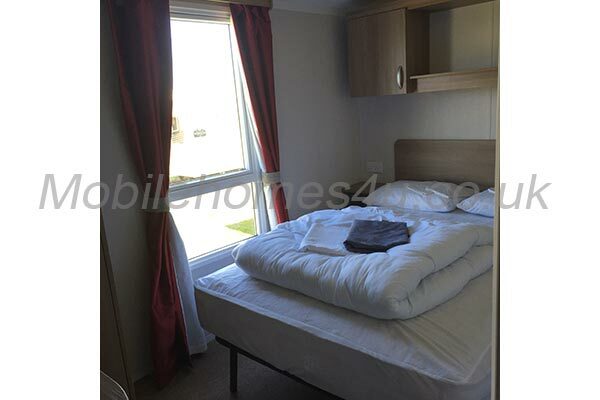 The main bedroom has a double bed and ample overhead storage and shelf unit.There is a large wardrobe for hanging clothes and internal shelf and draw unit also.The bedroom has a dressing table area with stool with a good size mirror. 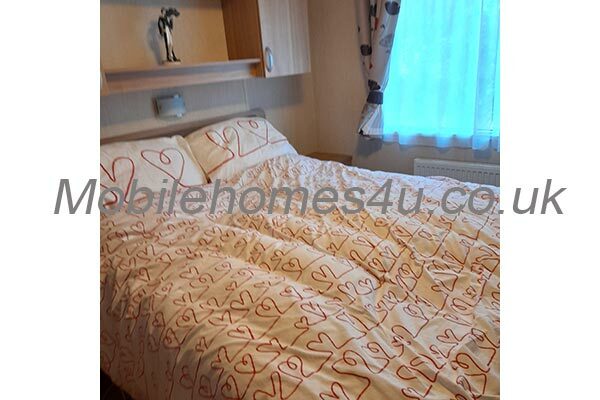 A King-size duvet and pillows are provided. 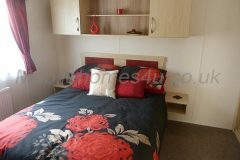 The second bedroom has two single beds with shelves and overhead cupboards and a bedside table between the two beds. 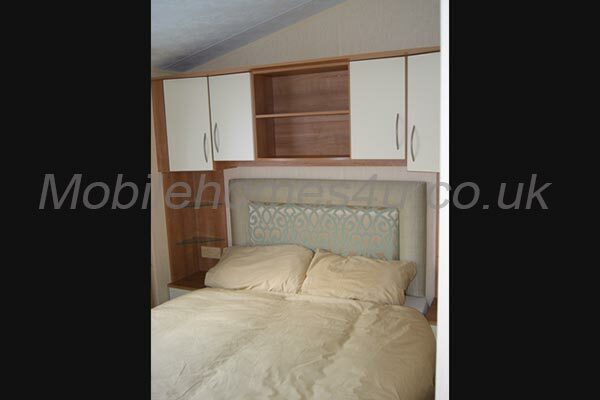 The wardrobe has a draw unit as well as ample hanging space. 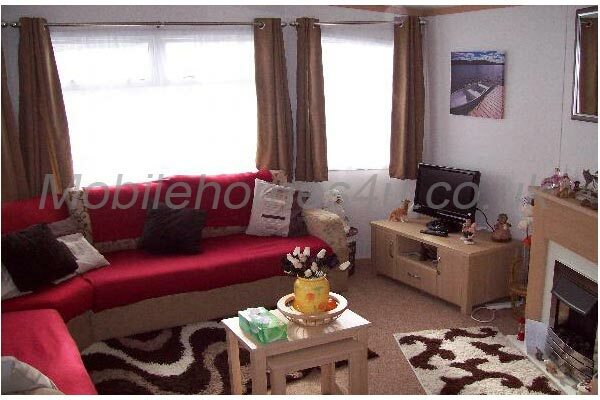 There is an electric point in the room. 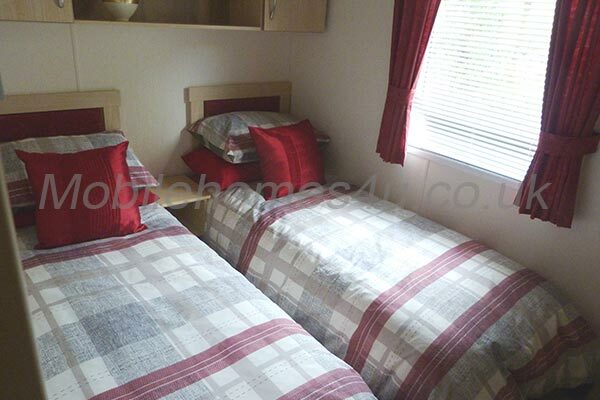 Two single duvets and pillows are provided. 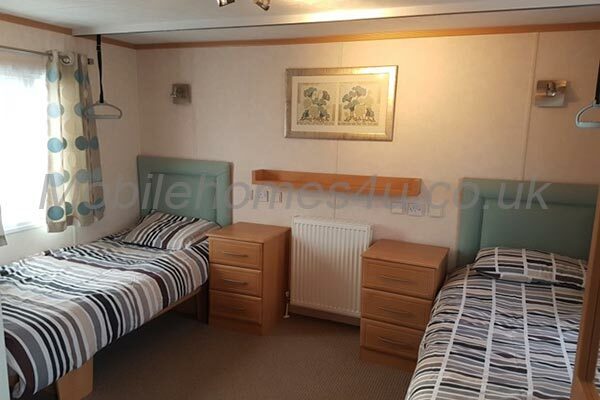 The third bed is a double pull-out bed in the lounge. 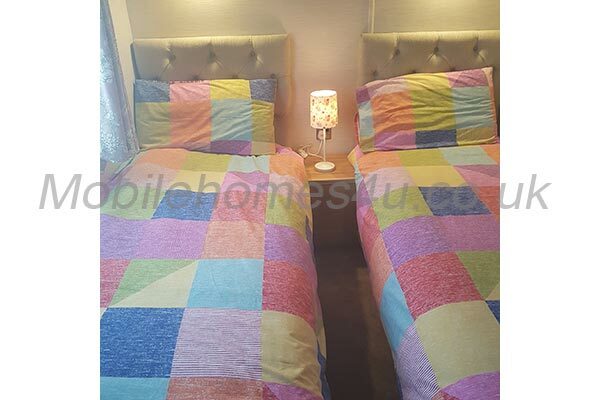 A double duvet, pillows and mattress enhancer are provided for use if required. Bedding packs are available on request at an extra charge but must be booked in advance of your stay. 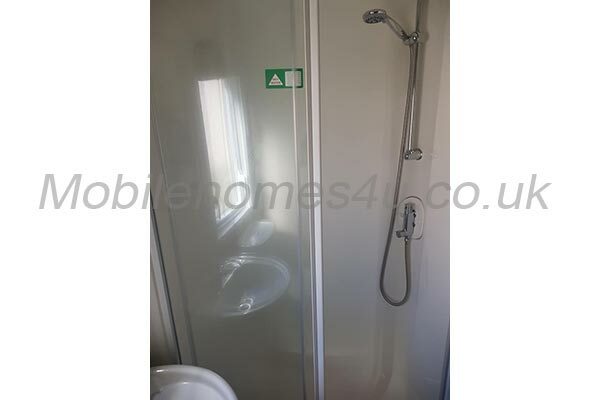 The bathroom is complete with a spacious shower enclosure and built-in shelf, under-sink storage cabinet and an additional bathroom cabinet has been added for your toiletries. 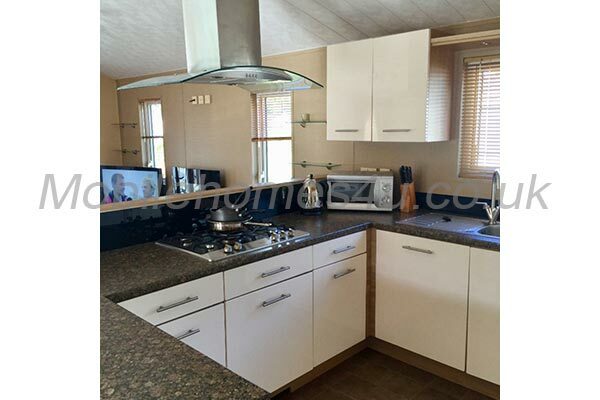 There is a large mirror over the sink and an extractor fan. 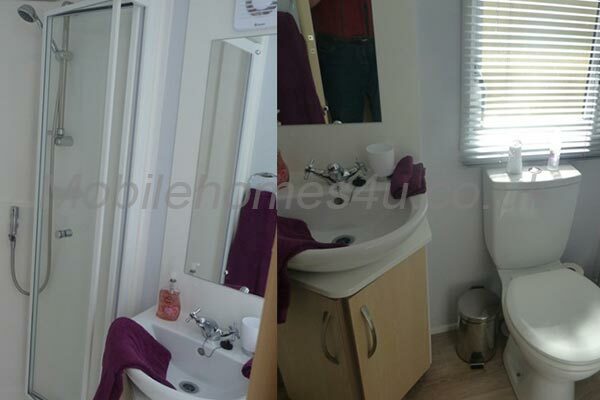 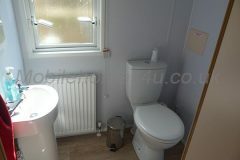 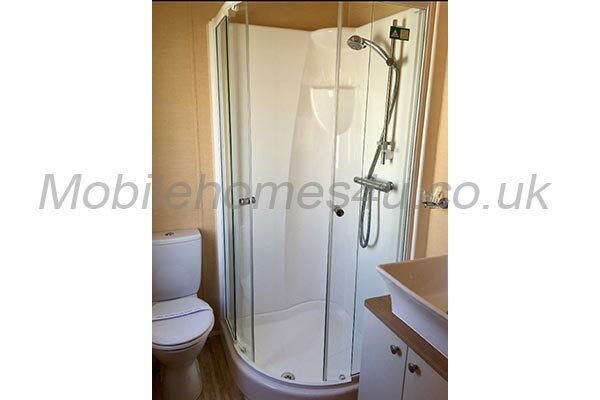 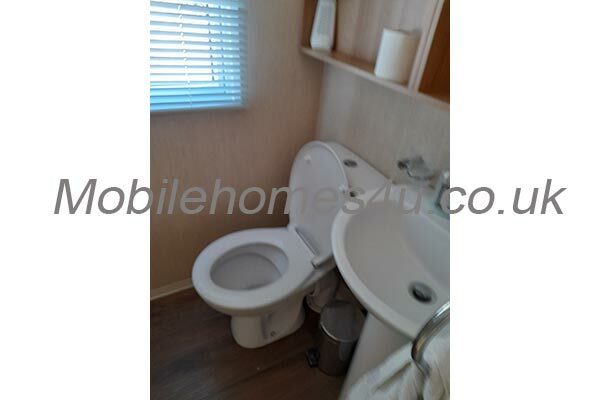 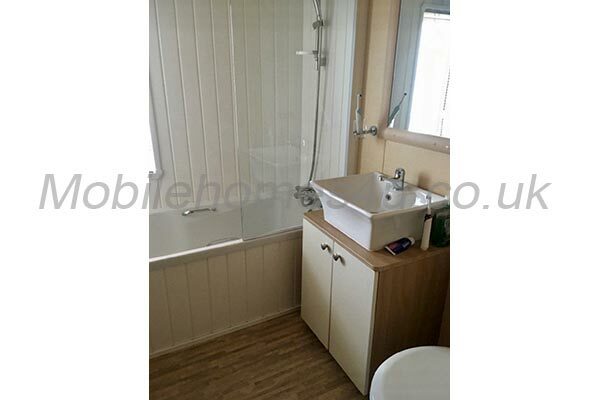 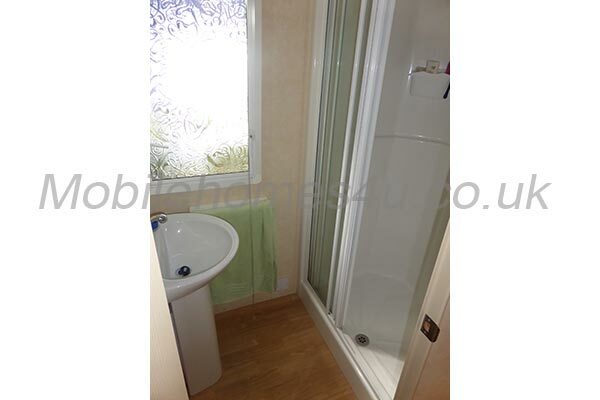 The en-suite bathroom to the main bedroom has a good size hand-basin and toilet with ample storage for toiletries. 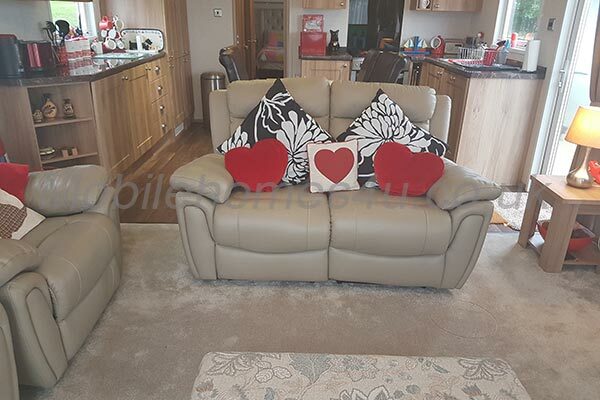 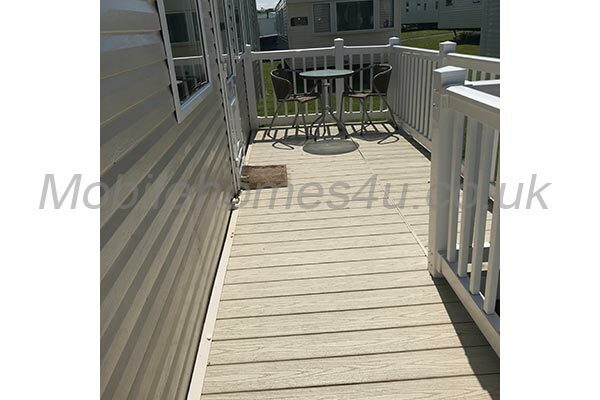 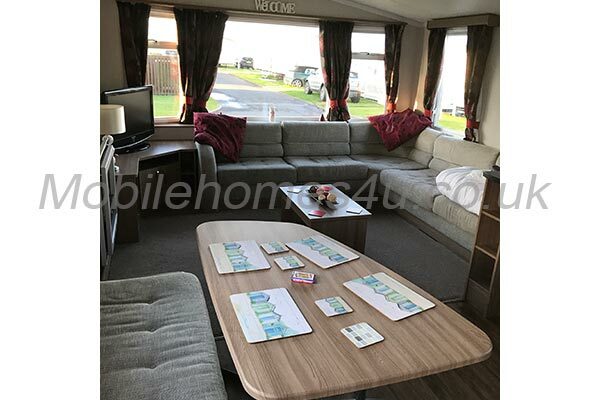 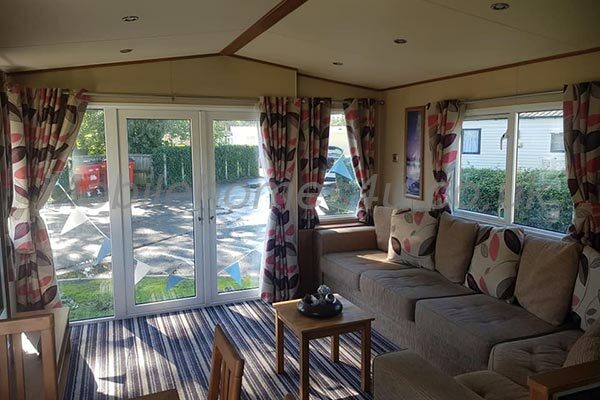 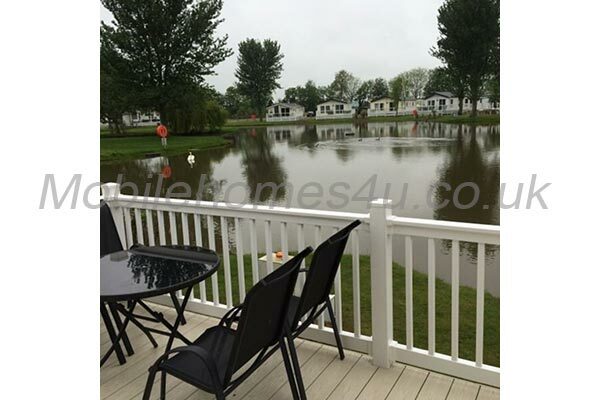 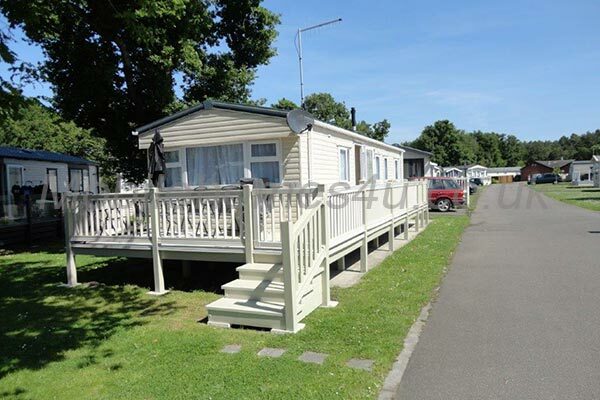 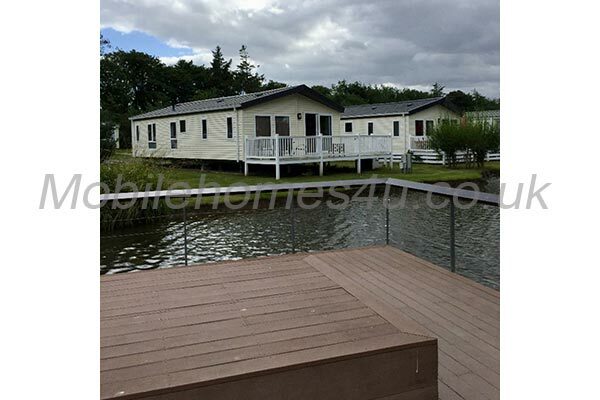 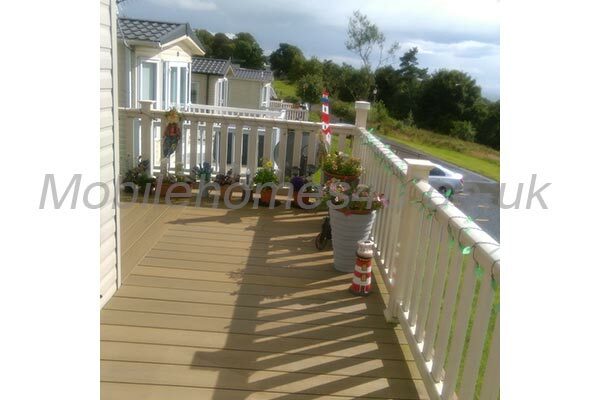 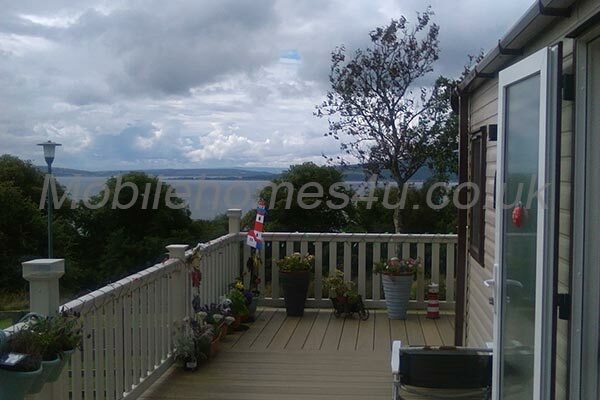 Our caravan has the advantage of good size decking with patio furniture with seat cushions and parasol which overlooks a stream and a wooded area and is very private. 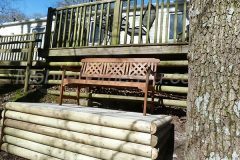 Below the decking, on the bank of the stream is an accessible patio area with a three-seater bench enabling you to take in the peace and quiet of our lovely stream-side setting. 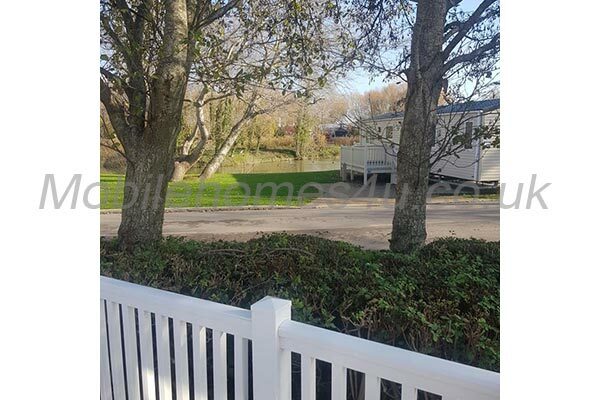 We would like to point out that the bank by the stream does fall away quite steeply and therefore children should not be left unattended. 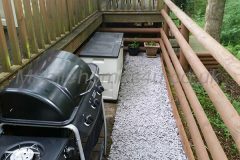 Below the decking is a separate fenced off area containing a gas three burner BBQ with side burner, which can be used for alfresco eating if required in the good weather. 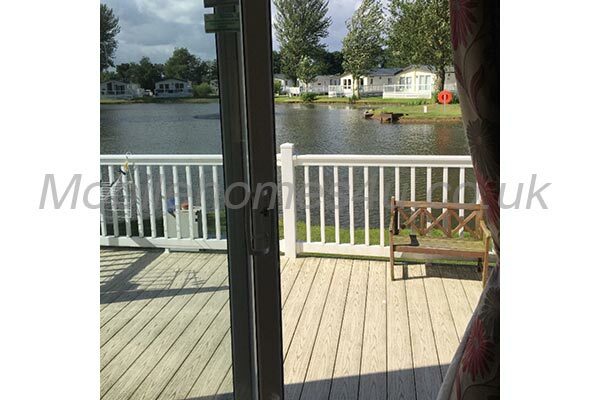 There is electric outside lighting which lights up both of the above areas. 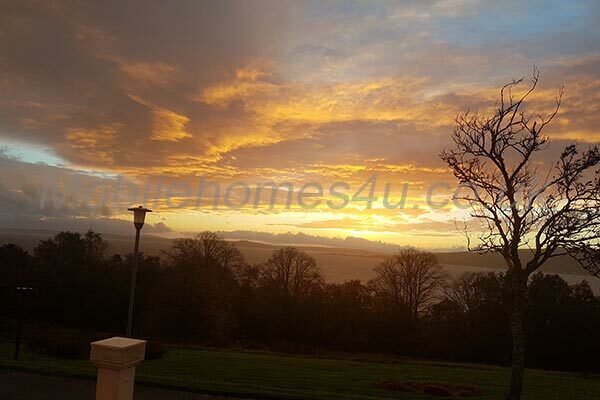 Aberdunant Hall is set within over 200 acres of woodland which boast streams, rock features and waterfalls and has plenty of walks from gentle strolls for the novice to more strenuous hill walks for the experienced walker. 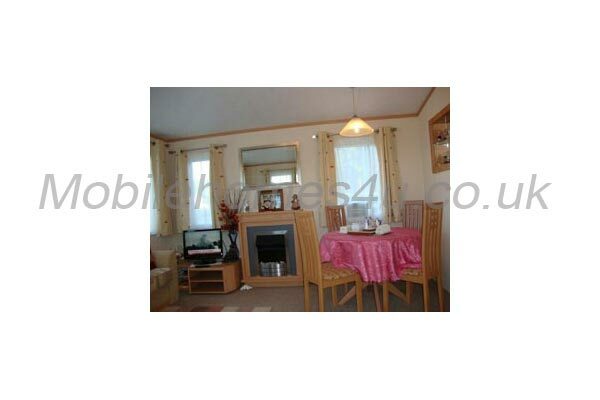 You can dine at the onsite Hotel which is a Victorian Manor House. 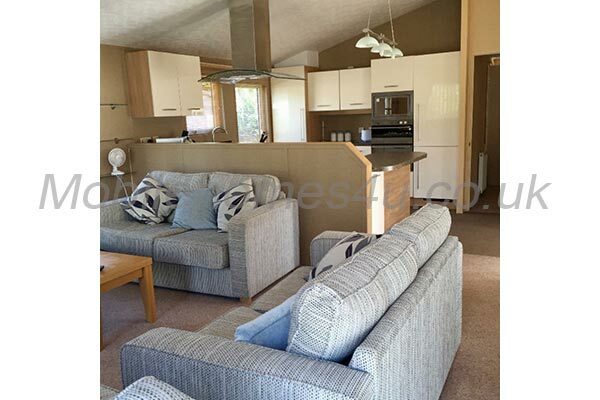 The food is excellent and children are welcome in the Glaslyn Lounge. 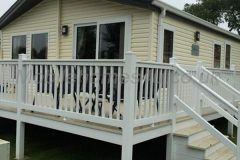 If food is not required then just have a drink on the Welsh slate terrace overlooking the stunning views of Snowdonia. 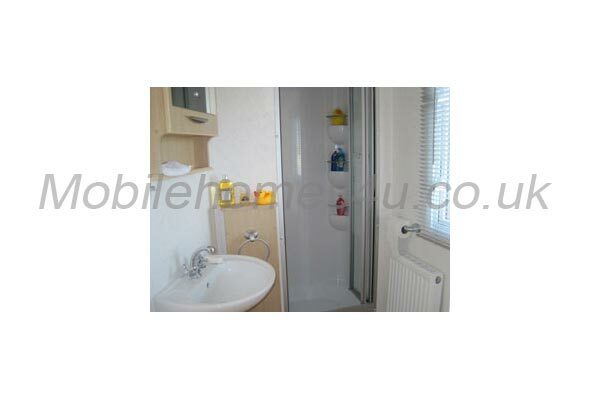 Also on site is a launderette with washing machines and driers available to use at a small cost. 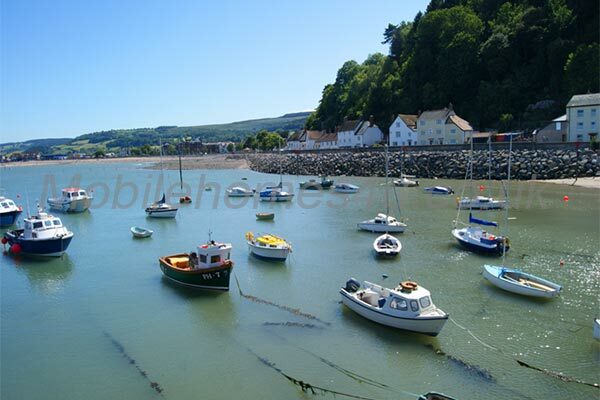 In Tremadog there is a Spar shop, Fish and Chip shop, a Restaurant and a couple of pubs that sell food as well. 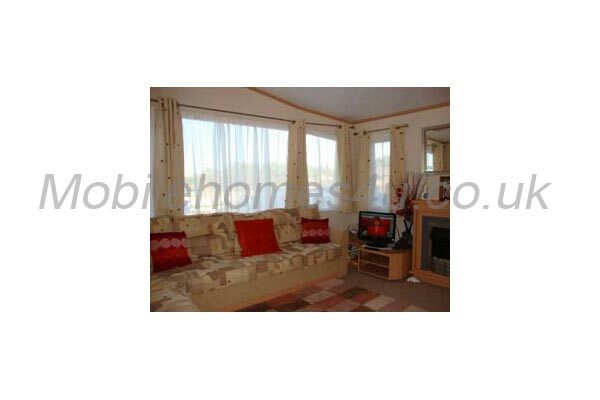 In Porthmadog there is a Tesco, Lidl, Aldi and a selection of other shops to frequent. 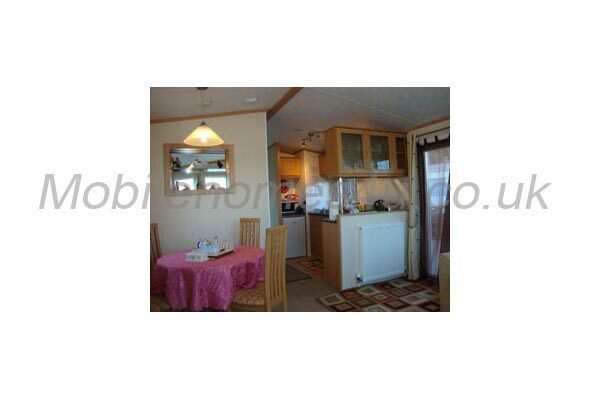 There are several eateries and take-aways there too. 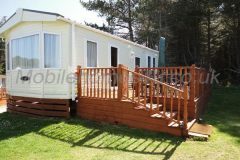 There is a 24 hour Warden on site and Wi-Fi is available free in the hotel and for a small charge is available in the caravan. 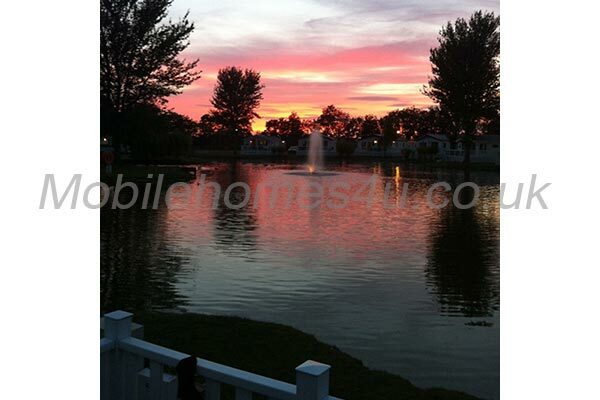 We have flexible arrival and departure dates out of the main season, please email for a quote or any questions. 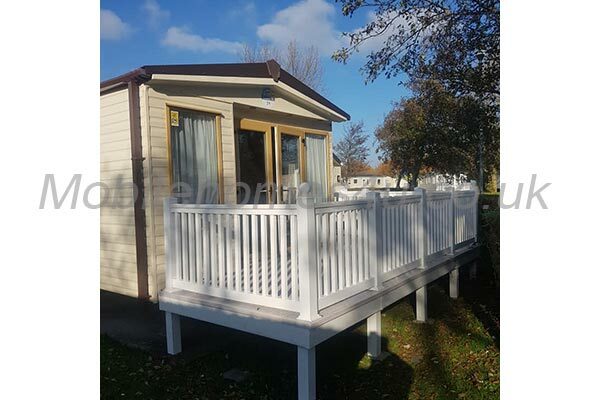 A £50 non-refundable deposit (for each week booked) secures your booking and the full balance is payable 6 weeks prior to the start of your holiday. 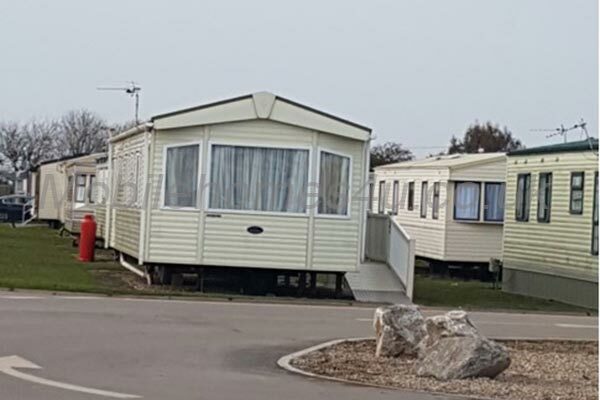 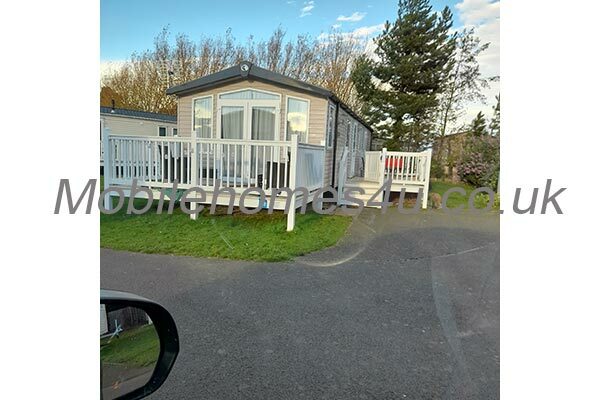 A £50 security deposit is required, this will be refunded in full within 14 days of the end of your holiday subject to the key has been returned and there is no damage or excessive cleaning of the caravan required. 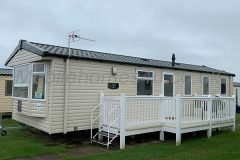 Your booking will be confirmed after the booking form has been completed and the deposit has been paid. Gas, Electricity and Water are included in the pricing tariff. 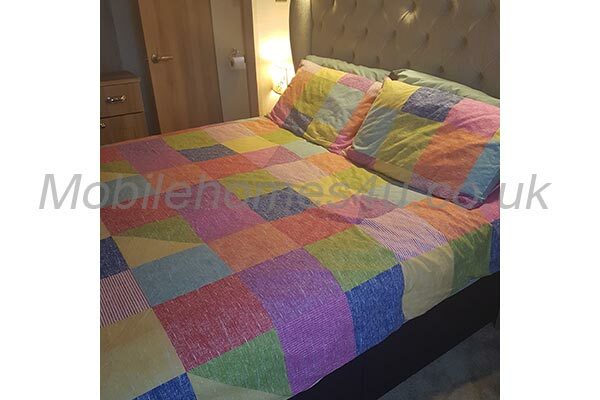 Bed Linen, Towels and Tea Towels are not supplied but we do offer bedding packs at an extra charge which must be booked in advance of your holiday if your require them. 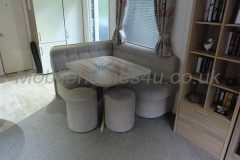 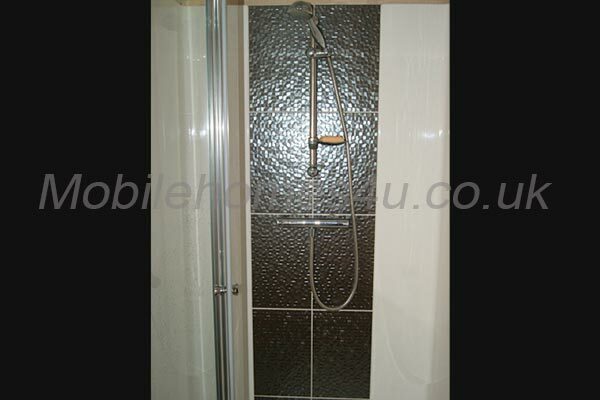 Price range (per week): £275 to £595. 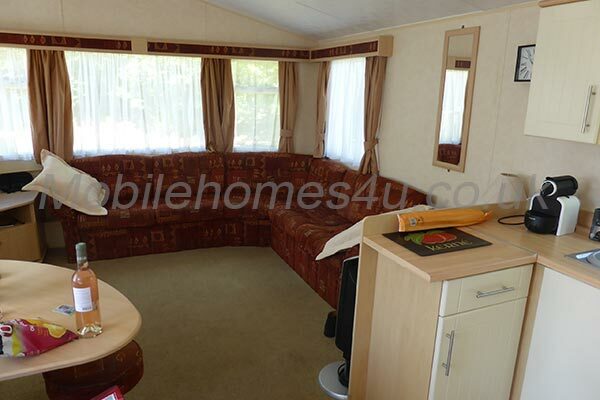 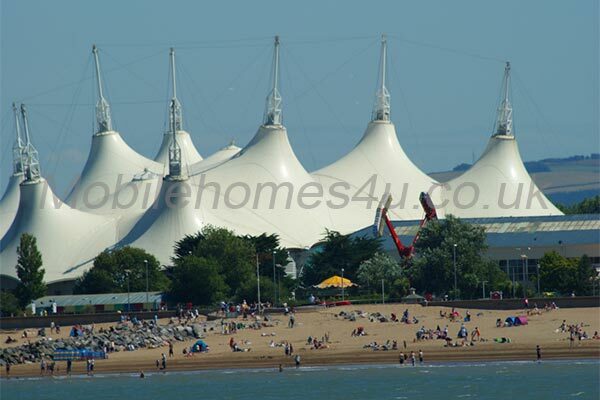 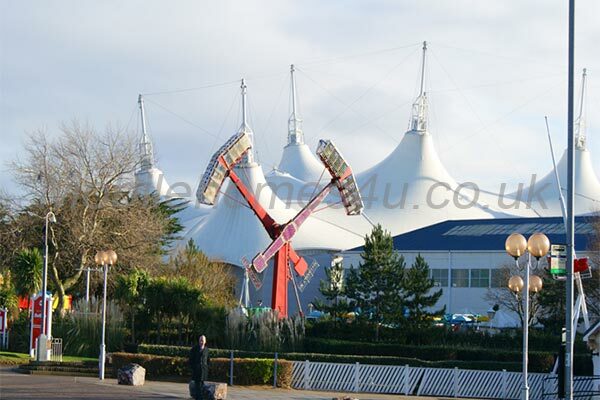 To book or for more information please contact owner or visit owner's website.